This Hearthstone paladin deck is a mix of minions and paladin abilities. 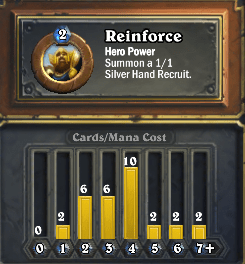 The usual gameplay for paladin is dependent on minions. Strategy is to try putting down many minions (low cost ones multiple ones like Murloc Tidehunter and Razorfen Hunter) keeping them alive for a long time and powering up those many minions using the +1/+1 abilities of other mid-high minions (Frostwolf Warlord and Stormwind Champion) … and crush the paladin enemy of course. This Paladin Hearthstone deck will give good wins in play mode and ranked mode without spending any Hearthstone gold. Of course it has its weaknesses but hey its a free Hearthstone deck good for beginners. Hope you like my Hearthstone Deck Paladin post. I will post more Hearthstone Deck Cheats soon here in menardconnect.com. Watch out for it.